In the United States, transportation of propane cylinders for home use is regulated by the National Fire Protection Association; the regulating associations in Canada are the Canadian Propane Association and the federal government. The requirements of both associations are similar, and they are essentially based on common sense. 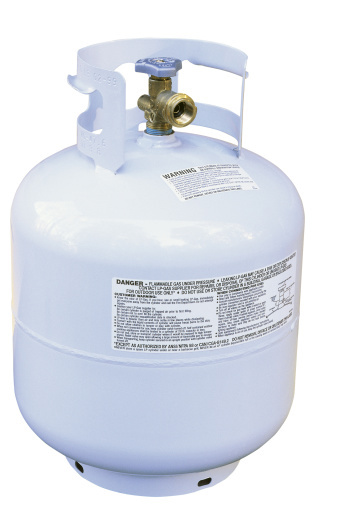 Propane is a highly flammable gas, and propane containers must be handled with care. You must transport propane cylinders upright. They cannot be laying on their sides. You must secure the cylinders in place -- usually with bungee cords -- to prevent them from falling over. Propane cylinders must be as far from the driver as possible and must be isolated from the engine and exhaust system, which means putting them in the trunk if you're driving a conventional automobile. If you're driving a pick-up, the cylinders can be in the bed of the truck, and they can be transported in the same enclosure as the driver of a box truck or single-compartment van. The total weight of the cylinders, including the propane they contain, cannot exceed 108 pounds. Since a filled appliance cylinder typically weighs 20 pounds, this requirement imposes a limit of five cylinders. If the cylinders have safety caps to cover the valve opening, those caps must be in place. Only older cylinders lack these caps. You can only transport propane in leak-proof containers --if you have an older cylinder you're not sure about, don't use it. You must place the cylinders on a flat surface, such as the floor of the car, a truck bed or the bottom of the trunk. You cannot transport more than five cylinders, but each cylinder can weigh as much as 66 pounds (34 kilograms). If you exceed this weight limit, your vehicle must bear a placard. You also need vehicle documentation, and the driver must be properly trained. Ventilate your vehicle. CPA regulations do not proscribe transporting cylinders on the floor of a car behind the driver, but if you do so, you must open the windows. Ventilate the trunk. If you transport propane in the trunk, you must leave the trunk open slightly for ventilation. The propane dealer typically supplies you with a latch for this purpose.